First paint the white square for envelope. Let dry. Meanwhile prepare ‘message’. Write out ‘I ❤ U’ on paper. Accordion fold the message so that there’s a flat side for gluing on top and bottom of inside of pin. Wrap rubber band around the long side to hold the pin open. Glue message inside as in pic. Let dry, trim off any excess. Remove rubber band. Finish by writing: ‘You have a message…’ and add envelope details with sharpies. Remove rubber band. This is so cute to give just because, or on an Anniversary, but also I’m going to remember this for Valentine’s Day too! Think of all the other ‘messages’ you could use! 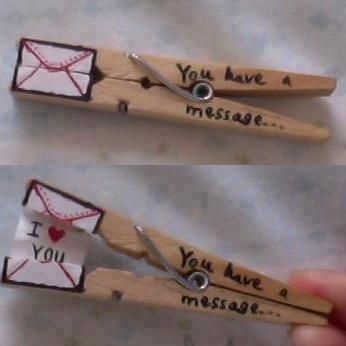 I want to do this, but make the clothes pin a dinosaur and the note a speech bubble saying ‘RAWR’. Because all I love is dinosaurs.